Single universal seat cover which will fit either a drivers or passenger single seat. 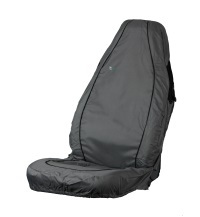 The Air Bag Compatible Seat Cover is designed for use on seats fitted with seat mounted Airbags. The cover allows for the unimpeded deployment of an airbag. Available in Grey and Black Only.